There’s a big change coming to WordPress in the not too distant future when the current WordPress visual editor will be replaced by a new editor that’s been dubbed Gutenberg. In this article, we’ll take you behind the scenes as we look at some of the exciting new features of the WordPress Gutenberg editor and how it is different to the current TinyMCE visual editor. 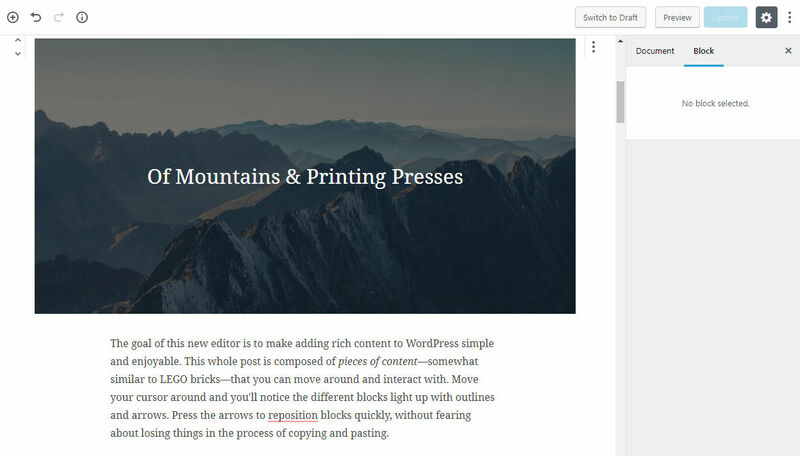 The Gutenberg editor uses blocks to create all types of content and aims to make customising your WordPress content easier and more consistent than ever before. Moving to a block-based system means that users will be able to build more complex page designs and visual layouts without the need for external plugins. This is something that is not currently possible in the TinyMCE editor. When will we see Gutenberg? At the moment there is no set date for when Gutenberg will be released, however, we do know that it is expected during 2018 and will be part of the next major release WordPress 5.0. At this point, it will be part of the core and will completely replace the TinyMCE as the default editor within WordPress. Will it look any different? The Gutenberg editor is a complete overhaul of the editor and not just a visual makeover. Based on a block system it makes it easy to add rich media, rearrange content and create extremely visual pages without the need for additional plugins. In short, Gutenberg provides the kind of changes that the WordPress community has been screaming out for and ones that are designed to bring it closer to some of the newer publishing platforms out there – we’re looking at you medium. One of the first things you’ll notice about Gutenberg is how clean it looks compared to the current editor. Each block now has formatting controls that are specific to it which means that you can quickly change the style of your blocks and make them look the way you want. Will it replace page builders? According to plans the initial phase of Gutenberg will be purely focused on page and post content and will not go beyond this core functionality. So in short, no it will not be replacing page builders, or at least not at first. Stages two and three of Gutenberg will see if moving into the world of page builder territory with the ability to edit page templates and ultimately full site customisation. This still does not mean that it will replace page builders as these often come with defined layouts and designs to help you build a beautiful website with ease. Also, premium themes often have their own eco-systems and loyal customer bases so we’d expect these to continue to dominate the market, especially with those looking to you it themselves. What changes will I need to make? This is one of the major concerns for a lot of developers and those involved in building themes and plugins. At this stage it looks like support will continue for existing WordPress functionality and that these will be transitioned into the new system with support for shortcodes, meta-boxes and custom post types. There will also be an official plugin to disable Gutenberg and bring back the TinyMCE editor for those who really don’t want to make the change. For those who want to see what it’s like to use the new editor without needing to install it on their own website, you can see a demo here.